I had a chance to spend an amazing weekend in Hulhumale’ and this is just another addition to my happy list. Ansaya-saya ko dahil nakapaglagalag ako. Hulhumale’ is the island where the international airport of Maldives is. Usually, people think that the airport is in the capital of Maldives called Male’, but actually, Male’ is one ferry away from the island where the airport is. Hulhumale’ ang tawag sa isla kung nasaan ang airport at iba ito sa Male’ na siyang kapitolyo na masikip, trapik at maingay. Hello Maldives lagi ko kayong pinopromote, bayaran niyo na nga aketch. We started the evening by riding a public bus from the airport to the city proper, if that’s what it’s called. That’s where the shops are, the cinema, etc., That was my first time to ride a public bus here in the Maldives. I mean, really, it’s just like riding a public bus in any other place but I was so excited because ever since I’ve been here, I have only ridden speedboats, dhoni, ferry and all other types of boats, motorbike, taxi and seaplane. So call me shallow but I was really excited about my very first bus ride. So last week, nagfeeling Dora the Explorer ako at naglagalag sa Hulhumale’ with my backpack. Kahit may political unrest na ay palaboy laboy pa rin ako, well, di naman din talaga delikado. OA lang yung balita, in case napanood niyo. Tuwang-tuwa ako sa bus dito dahil di siya tulad ng public bus sa Dubai na makikipagdigma ka na sa pakikipagsiksikan, makikipagdigma ka pa sa amoy. Ok, so here’s how we really started the evening. We had a nice dinner in a restaurant called Bread Matters and I can’t believe what I was seeing that time. The restaurant was buzzing with people and by the time we left, an acoustic duo was setting up their mic and stuff. I was so in daze that night and I can’t believe that I was still in the Maldives. I never expected the city to have that kind of social activities. I mean, I always thought that this place is just for quietude but hey, Hulhumale’s is just like any city too. Just a bit quieter and safer too. So normal din pala ang Maldives, may mga resto at kapehan. As in normal talaga siya, ako yata ang hindi. So after a nice dinner, we headed to the cinema to watch Black Panther. Again, I was so excited because this was my first time to see a movie in big screen, here in the Maldives. 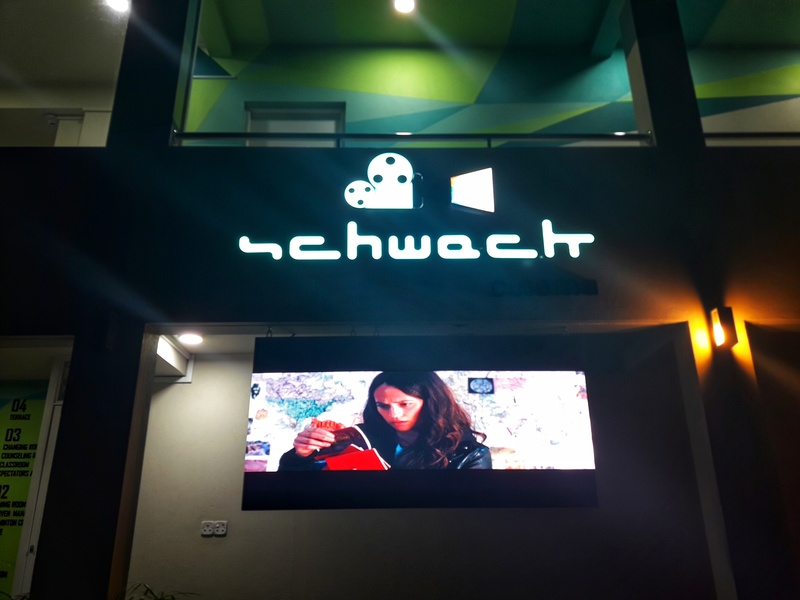 Not a Movie Night on the beach with a projector and bean bags everywhere but a real Cinema. So ayun, sobrang excitement ko talaga kasi ang ganda ng sinehan at sobrang ganda ng sound system akala ko nasa club kami nung nagpapatugtog pa lang sila bago magsimula yung palabas. After watching the movie, we headed back to Bread Matters to watch the acoustic duo. Again and again, I was too excited, I wasn’t able to contain it. Para akong ignorante sa sobrang saya ko dahil perstaym makrating ng promdi sa siyudad. Wag niyo ko i-judge. The next day, we headed to a cafe called Shellbeans to have breakfast. Two of us had crepes while the other one had cheese cake for breakfast. Actually, nakapag almusal na kami sa hotel na tinuluyan namin pero masiba lang talaga kami kaya nag almusal pa ulit. We then headed to the mall, quite the smallest mall I have ever seen. We bought gelato and proceeded to the park. It was so green and quiet and one part of the park reminded me of UP Diliman. Ang liit lang talaga ng mall, siguro sampu lang ang shops. Ganyan. Tapos gusto ko sana magpictorial sa park kaso ayaw ni mayora. Kaazar. Namiss ko bigla si Non-IG-husband. Kahit non-IG yung mga kuha at kahit nagmamadali siya dahil kinahihiya na niya ang pinaggagagawa ko atlit may picture pa rin. 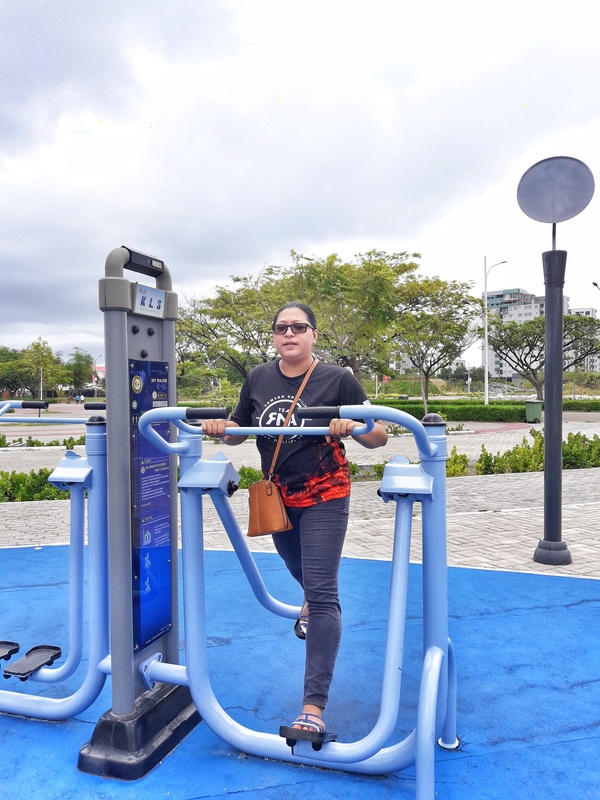 The park even had an open air gym and Mayora didn’t let this opportunity pass. She tried each and every equipment. Sinubukan ni Mayora na mag gym pero may baon siyang sandamakak na chichirya. Hah? Nakita niyo ba yan mga hampaslupa? Ang yaman ko nung gabing ‘yan. Lobster. If you have read this post till here, you might think I’m quite shallow to be very excited about all these simple things. But you know what, you will really appreciate anything and everything once you don’t have it anymore. When I was still in Dubai, all these were very accessible – cinema, mall, restaurants, etc., and I just grew tired of them. And now, I get very slim chances of going out to the city and do all these stuff so I feel really happy whenever I could. This is one of my very few posts with translation. If you have read and understood both languages, please be so kind as to rate the translation on the comment section so Google can hire me. You know, I always hear ( or read ) the word ” hugot “…… what exactly does it mean ???? What is ” push ” in Tagalog ? Is hugot a verb or a noun? 5! So Google and Maldives Tourism Board should hire you! Lol. My rate to your translation is…. of course 5! So Google, hire this lady because you don’t know what you’re missing. Ayus ang translation lol! 5 star yan 😂 Pero it’s good to truly appreciate the “small” things. They’re sometimes more meaningful than the grandeur things. Defintely five! (translation: De-Lima!) Huh? Sobrang tempted po ako na yung translation nalang yung basahin. Haha. And teka 5 po ang rating ko senyo! Pak! Akala ko nung una siryoso yung translation hahaha pero kahit na, 5 pa din. I-hire ka na sana ng Google!! !